The year was 1975. Harvard dropout Bill Gates and a friend launched a fledgling computer company they named Microsoft. John Travolta made his television debut as Vinnie Barbarino in "Welcome Back Kotter". A little movie known as "The Rocky Horror Picture Show" had just flopped in theatres but was making a comeback on the midnight circut. The textile world was filled with polyester, corduroy and of course gaudy multi colored sequin fabric. It was a glorious time for the Rocky Horror enthusiasts. One could hardly walk into any Five and Dime without stumbling accross a premade Rocky Horror costume. In the years following, time had not been kind to us. First came the vinyl jackets of the 80s. Then the Hammer pants of the 90s. Where could one find fabric for their costumes? Especially those gaudy multi colored sequins you need to get that perfect columbia bustier? It wasn't until 1999 when Kim Shafer took it upon herself to make "the PERFECT Columbia Boustier Material". 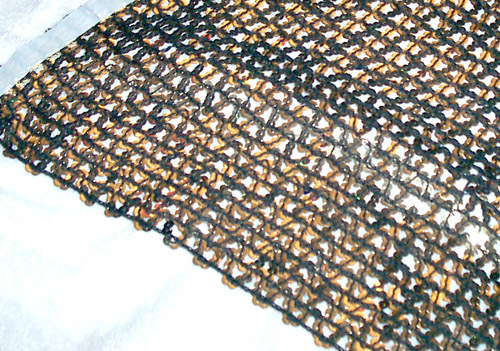 It was custom made with the correct sequin colors and an easy to work with strand knit backing. Columbias the world over rejoiced. Sadly however she was sold out in less than two months. Columbias have been clammoring for fabric like this ever since. In an effort to help the Rocky Horror world I took it upon myself to get some custom made. I just got it in from the manufacturer just the other day. Holy crap is this stuff amazing! (Finally, the good stuff, damn you talk a lot Larry). The fabric is 18 inches wide. You will need 1 - 2 yards to cover a bustier. One yard if the girl is size 8 or under. A little more for bigger girls and those with the ample cleavage. The sequins are flat just like in the movie. Red, green, blue, silver and gold, just like in the movie. No lining, just connected stranded sequins on somewhat stretchy strands. The fabric is exactly like Kims with one or two minor differences. Her strands were yellow, my strands are black (to match the black corset backing better). The backs of the sequins are gold on my fabric (see photo 3). Not that this makes a difference as these sequin backs will be facing your body and not the audience. 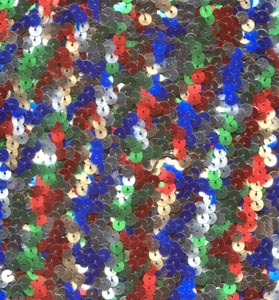 Just like Kim's material, the fabric was made using spot pattern sequin dying as most sequin fabrics are made these days. This will occasionally lead to some half blue half green sequins for example. 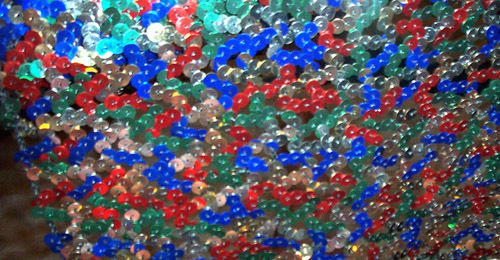 Unless you are holding each individual sequin next you your eye you will not notice this. Certainly not from a stage. It is sold for $50 a yard. You will not find this fabric anywhere else as it was explicitly custom made. This is as good as it gets...and it's damn good. Payment can be made by Paypal or by money order. Please email larryv@nominex.com for mailing address.